I was absolutely delighted to receive a review copy of Crazy Water Pickled Lemons by Diana Henry from Octopus Publishing. My Levantine genes will out, so it’s no surprise that Mediterranean cuisine is a favourite of mine. Much as I love Middle Eastern food, however, this book has a wider reach than a classic Claudia Roden for example. Subtitled enchanting dishes from the Middle East, Mediterranean and North Africa, it is a gentle blend of cuisines, flavours and techniques, adapted by Diana to form her own take on this culinary heartland. Before receiving this book, I’d never heard of Diana Henry – shame on me! Now an award winning food writer for the Sunday Telegraph, Diana didn’t come to food writing until relatively late in life. She has, however, always been an avid cook and food adventurer and her enthusiasm shines through the book and leaps out at surprising moments. 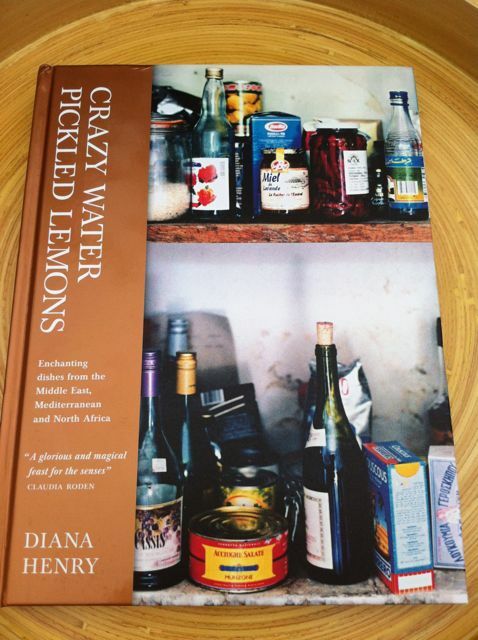 First published in 2002, Crazy Water Pickled Lemons was the first of six books that Diana has written (so far). This is a revised edition published this year. For me this book is evocative of the Arabian Nights, avidly read as a child. Later as a teenager, I was somewhat bemused by the unexpurgated version I’d got hold of. Anyway, the book itself is hypnotic in its sensual, magical, exotic and haunting qualities. The very chapter headings are compelling in their otherworldliness. Take for example, Fruits of Longing highlighting figs, quinces, pomegranates and dates, Plundering the Stores where almonds, hazelnuts, pine nuts and dried fruits come to the fore, The Spice Trail with its mouth watering use of cardamom, chilli, cinnamon, cumin, ginger, coriander, pimenton and saffron and Heaven Scent with recipes using flowers and flower waters. And the drowsy photography fits right along, with half glimpses of foods remembered from some nostalgic dream-time. This is not usually my favourite form of food photography; I like to see the finished article in all its clarity which gives me an idea of what I am aiming for or aspiring to. But here, this form of photography fits well. Yet, despite this whimsy, the content is very much grounded in reality. This is a book of recipes that would be familiar to thousand of home cooks around the Med. As a vegetarian, I was slightly disappointed to see so many meat and fish dishes, but there are some nuggets to be pulled from the predominantly carnivorous pages. Kushary was one I was particularly excited by. A meal of rice, lentils and macaroni, this is one of Egypt’s national dishes and is particularly prevalent in Cairo. Despite having eaten it a number of times whilst living there, I have never yet made it. There are also plenty of ideas for mezze including flat breads and pickles. And of course, with the Med’s notoriously sweet tooth, there are a number of treats to keep the sugar lovers amongst us satisfied. Diana’s writing more than makes up for any lack of flesh free dishes, indeed this book is a joy to read. Each chapter begins with a three page contextual narrative which tantalises so you can hardly wait to plunge into the recipes that proceed it. Pickled lemons I’m assuming all are familar with, but what is this crazy water referred to in the title? Fellow vegetarians, read no further, it’s all about sea bass. In Diana’s own words “Ah, the title dish. And I must say I initially fell in love with it for its name. It’s from the Amalfi coast and nobody really knows why the dish is called “Crazy Water”. Some have suggested it alluded to the sea-water used by fisherman to cook their catch at sea, others that the “crazy” refers to the heat imparted by the chilli“. No review is complete without at least one recipe being tested. I don’t really associate the Med with chocolate, so I was somewhat anxious that I wouldn’t have any chocolate recipes to try. But I needn’t have worried, there are four to choose from and all of them sound enticing and exotic: chocolate and rosemary sorbet, herb-scented truffles and stuffed figs dipped in chocolate. The one I chose to try first was a chocolate, hazelnut and sherry cake with sherry-raisin cream. This will be featuring on my blog at some future date, but for now I can report that the recipe was surprisingly simple, easy to follow and every bit as good as Diana promised. I always wonder when they say “revised” what bits changed. I have this book from 2002 and love it (if you like Diana Henry now, you really should have a look at her more recent book Plenty. Lots more vegetarian recipes!) but what if everything I love has been left out?! Thanks Foodycat, will look out for Plenty – whose came first I wonder Diana’s or Yotam’s? Just looking on Amazon, the 2002 copies are worth quite a bit more – so maybe they did cut quite a bit out! Ha ha, you may live to regret those words when I turn up on your doorstep demanding cake! Lots of questions for you. Which book have you got and have you ever used it and with what result? Thank you. I can’t believe I’ve been so slow on the DH uptake. Isn’t Middle Eastern food fabulous? One of the reasons I like it so much is that it’s great for vegetarians, although I also loved it when I was a meat eater. Roasted Figs & Sugar Snow is such a great title. A wonderfully written and concise review….it is interesting to see how many points we agreed on when discussing the book. I have made two of the recipes from the book already, and they both been just lovely. Thanks Karen, I really enjoyed reading your review too. In fact, I think now I’ve done mine, I shall read yours again. I was flicking through this book and Roast Figs Sugar Snow also by Diane Henry and wondered why I had not cooked from it. Lots of recipes bookmarked for when I move home. Shaheen, is there a cookery book you don’t have? What are your thoughts on the meat / vegetarian balance and is Roast Figs any better? I’ve seen this book, but the title put me off a bit. However, it may be worth another look after your review! Don’t let the title put you off Janice, it’s a fabulous book. Love this book and I made the chocolate and sherry cake some time ago – delicious! Great review – must resurrect my copy. Oh BVG, I will come pay you a visit and have a look at what you thought about this cake. A really interesting and informative review, Choclette. This is a book on my “to buy” list, simply because I love Diana Henry and wanted to read her latest offering. But having read your review, I know that this is a book I really need to own. Out of interest, I think I am right in saying that Diana Henry writes the in season section at the front of the Waitrose magazine too. Thanks Charlotte – co-incidentally a friend gave me a copy of Waitrose mag this week and I saw the section by Diana Henry, then read your comment! I must have seen her there before, but as the name meant nothing, it was easily forgotten. Although the whole book sounds wonderful, I have to admit I do slightly have my eye on that cake photo you’ve included at the end… Yum. Thanks Little Loaf – good to see the name in Italian and love the idea of a restaurant named as such. The cake is rather a good one and as it was so huge, it’s lasting us ages. Ohh I have this one…although it’s a different cover. There are some lovely recipes in there! Actually I should revisit, it’s been awhile since I even opened it. Cityhippy, I have rather a large number of books I need to revisit. It’s usually when I’m having a clear out and think, have never / hardly ever used this book, better get rid of it, then on perusing wonder why on earth I haven’t used it more. Thus books in this household don’t get passed on very often! Yes, it’s a great title Celia. Another of hers is Roast Figs Sugar Snow, which I also like the sound of – haven’t actually seen a copy of that one though. They say that everyone “has one book in them”. Unfortunately for me Diana Henry has written mine already and it is called Plenty. Wretched woman, how dare she 😉 I have heard that’s a particularly good one though. I have this book too and love looking through it and drooling at the recipes but haven’t actually used it much. I read someone else’s review too this week and now I’m feeling I really should start using it! Corina, sometimes food books are best just read – giving inspiration and enjoyment is well worth having a book for. My mum got me this book for my birthday and I love it! Great ideas! This is one of my favourite books! Really love it! The sherry cake recipe sounds delicious! The book has an odd title but your review makes it sound more interesting. The Amalfi coast is an area I would love to visit and taste the cuisine.